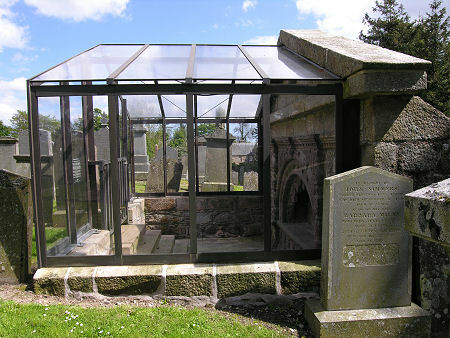 The kirkyard in the village of Tarves is home to the Tolquhon Tomb, the superb monumental tomb in which are buried William Forbes, 7th Laird of Tolquhon and his wife, Elizabeth Gordon. William Forbes was Laird of Tolquhon for nearly 50 years. The family residence was at Tolquhon Castle, about a mile and a half south of where he now lays. In April 1584 William Forbes commenced a major reconstruction of the castle which was completed in October 1589. It was also in 1589, only shortly after he completed work on Tolquhon Castle, that William Forbes paid for the insertion in the south aisle of the parish kirk at Tarves of the Tolquhon Tomb. He was laid to rest here on his death in 1596. 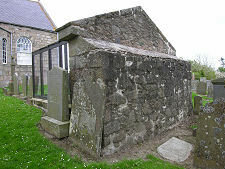 The old kirk at Tarves was replaced by the current parish church in 1798 on a site moved just a few yards to the north, but the Tolquhon Tomb was retained together with its backing section of kirk wall. Today it is protected from the elements by a modern transparent structure. Finding the tomb is relatively straightforward. 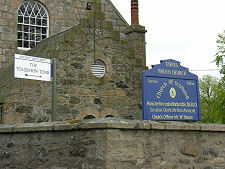 A sign points visitors into the kirkyard, which is just to the east of the centre of Tarves. Within the kirkyard you simply go round to the south side of the church and the protective structure surrounding the tomb is unmissable amid the more recent gravestones. The tomb itself is remarkably well preserved given it is over four centuries old. 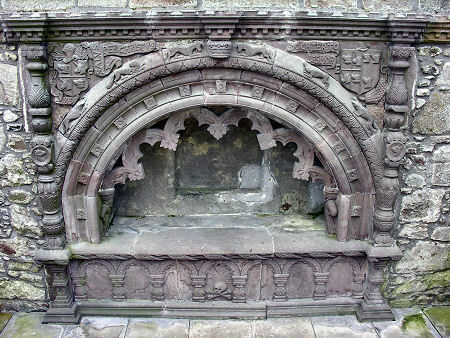 The decoration can be described as a mixture of Gothic and Renaissance, and although the basic form of a tomb set into a kirk wall is very medieval, the unknown designer of this particular tomb (who just might have been the well-read William Forbes himself) was clearly trying to give it what, for its day, was a very modern twist. Many of the details are fascinating. 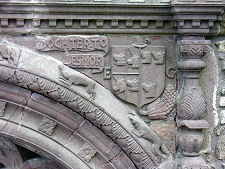 From the crest on the wall some way above the tomb to the arcaded front of the tomb chest itself, nothing has been left unadorned, whether by the Forbes and Gordon coats of arms, by floral and animal motifs, or in more abstract ways. 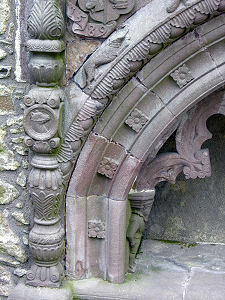 Perhaps the nicest touches of all are the two little figures carved on the inner faces of the tomb, one at each end, with that on the left representing William Forbes and that on the right representing Elizabeth Gordon. The little figure of William Forbes bears a striking resemblance to a larger statue on the gatehouse at Tolquhon Castle, suggesting that is also of him. 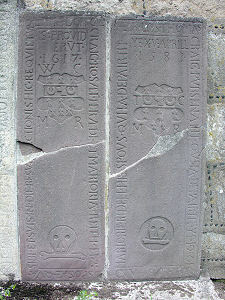 Although you will probably visit Tarves kirkyard to see the Tolquhon tomb it is not the only fascinating memorial on view, nor is it the oldest. 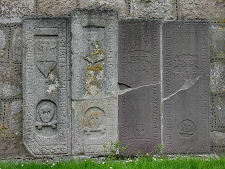 Leaning against the south face of the present parish church are four memorial slabs. 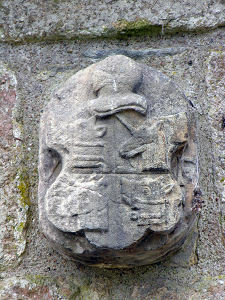 Two of these, dated 1583 and 1617 commemorate members of the College of Heralds, Thomas Craig and William Craig. The others commemorate a parish minister, Thomas Gardyne, who died in 1633, and his wife and sister-in-law, Isabel and Agnes Chalmers.